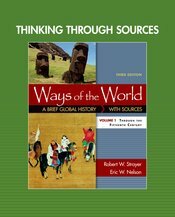 NEW Thinking through Sources primary source reader supplements the "Working with Evidence" source projects in Ways of the World. With six to eight carefully selected documents per chapter, this two-volume primary source reader presents a wide range of documents that connect to topics in each chapter in Ways of the World. Headnotes and questions to consider before each document help students approach the documents and essay questions at the end of each chapter provide a starting point for classroom discussion or a written assignment. This collection of sources is available both in print and in LaunchPad with innovative auto-graded assessment. Learn more about the "Thinking through Sources" activities in LaunchPad.